Let's face it YNAB is amazing. It's simply the best tool for managing your finances. But sometimes you just need the power of Google Sheets to crunch some numbers. We love YNAB, it’s our budget management and account aggregation tool of choice, and the team behind it are truly inspiring. But we also love a good ol’ fashioned spreadsheet! 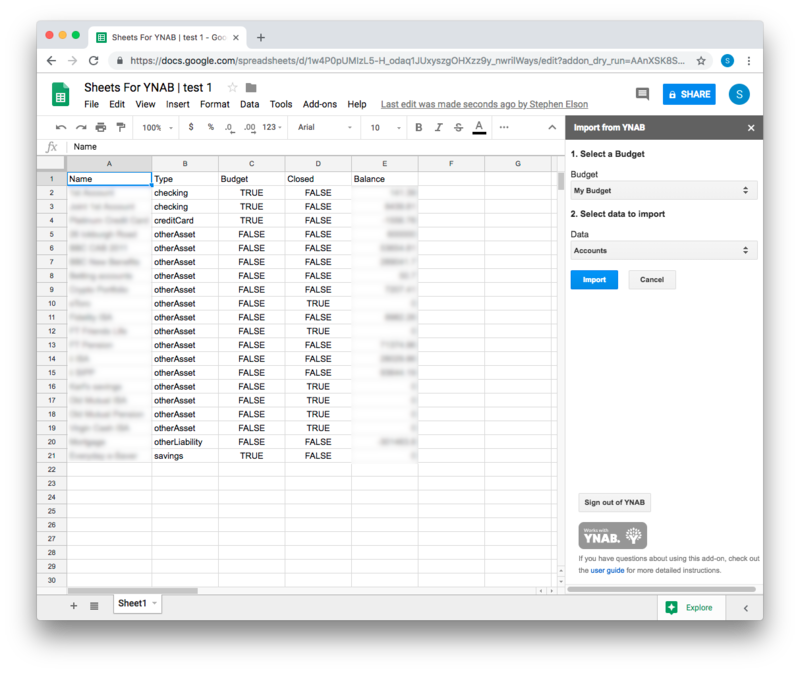 YNAB provides a CSV export for all of the your data, but it can be a chore downloading and importing these into Google Sheets (our preferred spreadsheet app). We wanted to make this simpler, so we built Sheets For YNAB. Sheets For YNAB never writes any data to your YNAB budget, stores any of your budget data or sends it to third parties. Once data is imported into your Google Sheets document it is yours to keep, delete or share as you see fit, but we do not keep any copies of it. See our privacy terms for more information. Search for “Sheets for YNAB”, and click the + FREE button to install it. Alternatively, visit the Chrome Web Store listing. After you have installed the add-on, you need to authorize it to access your YNAB budget. Select Add-ons > Sheets For YNAB > Import from YNAB. You should now see the main sidebar. If this is the first time you’ve used it, you will need to sign in to YNAB and authorize Sheets For YNAB to access your data. To get started, click the Authorize With YNAB button. By default many browsers block pop-up windows, you will need to allow this window to open in order to proceed. For example, here’s what Chrome displays when the Sign In button is pressed. Either click the link at the top of the warning to go to this page just this once, or select “Always allow pop-ups and redirects from https://docs.google.com" then press Done. If you manage to negotiate successfully with the pop-up blocker, a new tab will open containing the YNAB authorization screen. Please read the information carefully and if you are happy to proceed press the Authorize button at the bottom of the screen. The authorization tab will close, and you can return to your Google Sheets tab. 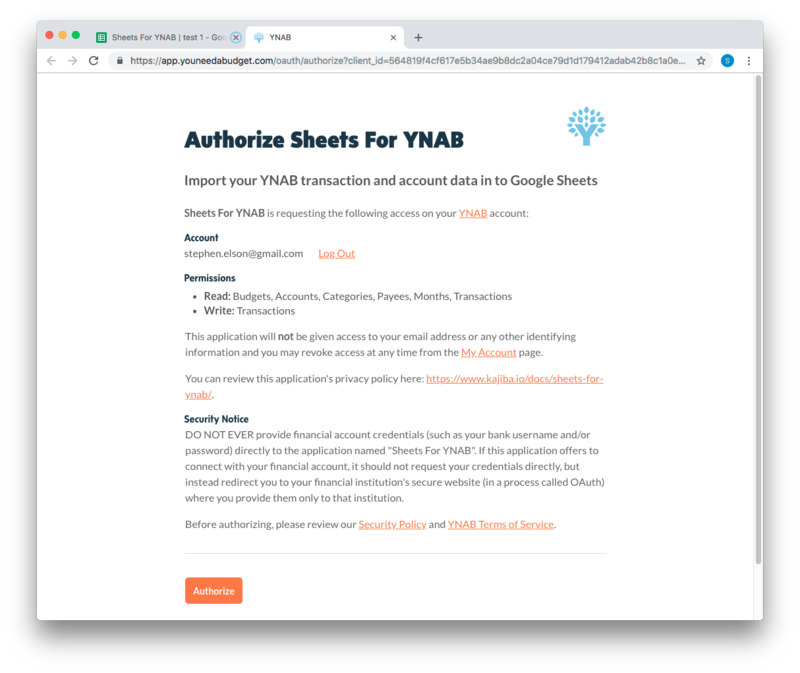 When using the add-on in the future, you may be asked to authorize again but this should be instantaneous, unless you have explicitly removed the Sheets For YNAB authorization in your YNAB settings. In this case, you will have to reauthorize it again. Okay, now we are getting somewhere! In the sidebar you should see two dropdowns. Most people just have one YNAB budget, but if you have more choose the one you want to import from. Finally, select the type of data to import. You can choose from a summary of accounts information (including balance), or your complete set of transactions. Depending on how long you've been using YNAB, the list of transactions can be very large and take several seconds to appear. Before we import the data you are asked to confirm that you are happy for the current sheet to be completely replaced. Note that formatting information is retained. If you have previous data from previous imports that you have carefully formatted, you won’t lose that formatting. After a brief pause while the data loads, you will see your YNAB data in all it’s glory!